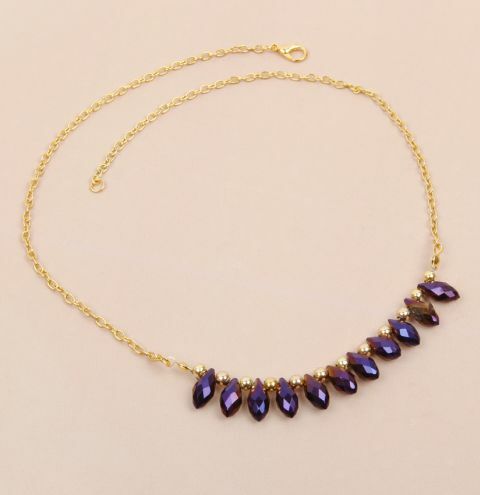 Make a sparkly drop necklace to wear on evenings out or to bling up the collar of your favourite blouse! Cut a length of thread and thread on a calotte and crimp bead. Take the thread back through the calotte, leaving a short tail. Squash the crimp bead and close the calotte. Attach a jumpring to the end of the calotte. Thread on a spacer bead, followed by a drop bead and repeat to until you have strung on all of your drop beads, finishing with a spacer bead. Thread the wire through a calotte and crimp bead and finish the strand like your did at the beginning. Use a jumpring on either end of the beaded wire, to connect the centrepiece to two 8 inch pieces of chain. Finish your collar by atatching a lobster clasp and jumpring to each end of the chain.